The most obvious advantage to accepting traveling pet owners is the increase in bookings. People who travel with their pet seek out pet friendly accommodations who will welcome their pet. They usually stay longer and more often become return customers. For the most part, they are considerate travelers who want their pets to be on their best behavior. Another benefit to becoming pet friendly is the additional exposure it brings. Chambers of Commerce usually designate pet friendly lodgings as such on their websites. PetTravel.com as well as other websites offer both free and paid advertising to pet friendly accommodations. Taking advantage of these offerings is important because they attract targeted visitors who are not just browsing; they are actively searching out a pet friendly hotel, motel, rental or bed and breakfast. Oftentimes event organizers in your city will refer people to your accommodation for those people attending with pets. In times of evacuation, when pet owners cannot take their pet to local shelters, they will look to you for shelter. Most importantly, pet owners who have a positive experience in your accommodation will recommend you to other traveling pet owners. There are important things to consider when making the decision to be pet friendly. Does the layout of your building allow for easy entrance and exit for pet owners? This is a great convenience to pet owners, who will need easy egress, especially in the mornings when a walk is necessary. Is there ample area to walk and exercise pets that is located away from guest traffic? Even though most pet owners pick up after their pet, it is important that this area be clearly marked and separate from normal traffic areas if possible. Fenced in areas are particularly appealing to pet owners as they can keep their pet confined while allowing for exercise. Are there rooms that are furnished with a pet in mind? If you have rooms that are spectacularly furnished, it may not be wise to open these rooms to pets. Keeping furnishings simple with not a lot of breakables will keep potential damage at a minimum. Do you have a pet policy? The most important thing to do when becoming pet friendly is to write a PET POLICY that your staff understands, and each guest reads before they check in. It should be specific and understandable. Any weight or breed restrictions need to be clearly stated in your pet policy as well as all deposits and charges. A suggested format for a sample pet policy appears later in this document. What type and size pets will you allow? 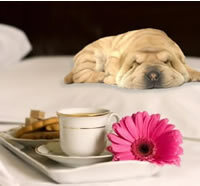 The easy way out for many innkeepers is to set a limit of 15 or 25 pounds â€“ dogs only. That's fine but it eliminates about 75% of your potential guests. A well behaved Labrador can be just a good a guest as a tea cup pet. Owners have fewer of these places available, especially in the chain hotels, so it is a wide open market. As for allowing cats, most places don't allow them because of something called cat dander. It's really not as big a problem as people make out of it assuming you vacuum the room carefully, change the linens and use a special spray. If necessary charge an extra fee for cats. There are a lot of cat owners out there would love to vacation at your inn. Calculate your expenses & deposits There are extra expenses that need to be covered when being pet friendly, such as an extra thorough cleaning of the room after the pet has departed. Pet owners understand this, and if you need to add $25.00 to $50.00 per visit as a pet cleaning fee, they will understand. Many hotels consider this a source of extra revenue, but, unless these rooms can be dedicated to pet owners, staff should take extra time cleaning for the next guest. If there is potential for damage, pet owners also will understand a refundable pet deposit. Cleaning - Thoroughly cleaning a room that a pet has occupied is extremely important. There is equipment that is specifically made to address allergens, but there are also other options. Changing HVAC filters, cleaners, air purifiers, and laundering goes a long way to cleaning a room that a pet has occupied. Get to know your 4-legged guests. Ask LOTS of questions about the pet when checking in. Does the pet sleep on the bed with you? Is the pet social? Are there issues with other pets or humans? Do you intend to leave the pet in the room alone? (you may have rules against this) If you do not want your guests leaving their pets alone, you need to furnish them a list of pet sitters in your area. The more you get to know your pet guests, the better both you and the owner will feel. Consider Getting a Pet. Although the decision to own a pet is totally an individual one, a "canine ambassador" is a wonderful way not only to greet traveling pet owners but to measure the social level of their pet. If their pet socializes well with your pet, then chances are that their pet will socialize well with other guests. In addition, it is a great way to start a conversation with your guests and make them feel more at home. Be sure that your pet is from a breed that is noted for social skills, and that they are exposed to other dogs and humans on a regular basis. Another benefit to having a canine ambassador is for marketing purposes. Your pet can be part of the brand of your accommodation. You may even consider donating a part of your bookings to a rescue league or non for profit pet related organization. The effort shows your commitment to the pet community and will further garner the pet owner's support. If your pet is a pure-bred, others who own that breed of dog will be drawn to your accommodation. That said, whether your canine ambassador is a pure mutt or pure bred, who can resist the sweet face of dog or cat? Pet owners will favor accommodations where pets are appreciated. Pet Amenities - As accommodations vie for pet travelersâ€™ business, accepting pets is not the same as welcoming pets. Offering amenities to pets is something your guests will remember, and it does not have to be at a great cost to you. Pet treats (homemade is especially appreciated), portable water bowls, "pet in the room" door hangars, and chewy balls or rawhide are such a personal touch, and something the traveling owner can take with them that will foster fond memories of their experience while staying at your accommodation. Providing your guest with a walking map of pet friendly restaurants, parks, and attractions nearby will also be greatly appreciated. Of course, clean up bags should always be a part of the package you hand out to traveling pet owners when they check in. Additional bags should be available at or near your pet walking area. Legal Issues- A well thought out pet policy will not only help limit your accommodation's liability, but it will help your guests know what is expected of them. Marketing - Now that you are pet friendly, you need to market yourself as such. Put a picture of a paw on your website that will take the viewer to a secondary page that tells about your pet policy, and what you have to offer pets and their owners. If you have a pet, put pictures of them on your website. This will impart to the viewer the love you have for pets, and encourage further interest in your property. Call your city's Chamber of Commerce and let them know. Also advise breeders and animal shelters in your area. Put an indication in front of your accommodation that you welcome pets. Lawn ornaments in the likeness of dogs or cats can be found in a variety of stores and on the internet. Another nice touch is a seasonal flag that can be mounted anywhere. Many designs include animals. Advertise on pet friendly websites such as PetTravel.com. Sites such as Pet Travel attract a targeted audience looking specifically for pet friendly accommodations and services. There is no doubt that you will enjoy new customers and make new friends by becoming pet friendly. Developing a pet policy - If you are considering accepting pets, it is vital that you have a clear and concise pet policy. It must be understood by your staff and it must be clearly understood by the guest before he checks in. Post it on your website. Have a printed copy at the front desk for the guest to sign. Mail the traveling pet owner a copy after they make their reservation. What types of pets will you accept? Is there a limit to the number of pets allowed per room? Are there size limitations? Are you going to charge a pet fee? Is it a one time fee for cleaning? Is it a refundable deposit? Is it a nightly fee? Is it a nightly fee per pet if you accept more than one? Do you provide pet items? Where can the pet owner walk and exercise their pet? Can the pet be left in the room alone? Do you offer pet sitting, either yourself or through a pet sitter? Off Limits - Make sure your pet policy states where the pet is allowed both inside and outside. Are there parts of your property that are OFF LIMITS to pets? When is check in and check out? If you are charging a refundable deposit, explain the terms and requirements of the refund. You may want to include a liability statement to protect you should a pet harm another guest or an employee. Be specific: You can walk your pet here but not here. You can have your pet in your room and in the lobby but not in the restaurant. A clear and concise pet policy will reduce misunderstandings and lead to a pleasant experience for you, the pet and the pet's owner.